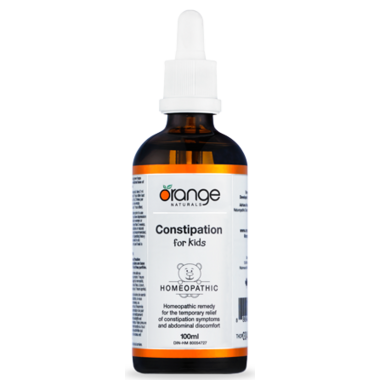 Orange Naturals Constipation for Kids can help relieve constipation in your little ones. Constipation is defined as a difficulty in passing stools and the infrequent passing of hard, dry stools. Constipation is an uncomfortable and unhealthy state to be in and the causes of constipation can be multiple ranging from dehydration and a low fibre diet to prolonged sitting, the side effects of medications or supplements (iron, painkillers, anti-depressants), the heavy consumption of junk food or a hormonal disturbance (such as low thyroid function). Orange Naturals homeopathic formulation helps get things moving again. Great for occasional or chronic constipation. Directions: For general dosing, ages 0-11 years: take 0.5 ml, 3 times per day; age 12 years and up: take 1 ml, 3 times per day. For acute symptoms, ages 0-11 years: take 0.5 ml every 30-60 minutes (up to 12 times per day); age 12 years and up: take 1 ml every 30-60 minutes (up to 12 times per day). When symptoms improve, resume general dosing. Take under the tongue or in a little water. Shake well before each use. Caution: Consult a healthcare practitioner prior to use if you are pregnant or breastfeeding, and during use if symptoms persist or worsen, or if new symptoms develop. Consult a healthcare practitioner if you have a serious medical condition. Do not use if seal is broken. Keep out of reach of children. This product did not work at all. Purchased for my 9 year old who hadn't had a BM for 3 days. Followed directions on bottle. After giving it to hey for 3 days, still no BM. Waste of money.